Welcome to Nemaco Technology's reference section that provides technical information for type of NEMA 12 enclosure. Nemaco has dedicated a technical section for NEMA 12 enclosures. This technical reference section provides the basic NEMA enclosure rating & definition, common sheet metal materials, mechanical hardware, paint coatings, environmental seals, miscellaneous parts and electrical accessories (if applicable). And Nemaco has provided a typical NEMA 12 enclosure examples (shown in the photos) for our customers. The top photo shows a NEMA 12 enclosure with the front door and two quarter turn latches available from Nemaco. The next photo (below) shows the door open with continuous seals inside the enclosure door. The front edges of the NEMA 12 enclosures required good seal to keep out dust and to be water resistance (to dripping water from a pipe, if applicable). Nemaco uses proven enclosure designs that eliminate most of the office dust and factory dust from getting on electronics. Also, Nemaco fabricates most NEMA 12 enclosures from carbon steel materials (i.e., sheet metal, hinges) and then powder coats entire enclosure surfaces uniformly. After the power coating is cured and dry, then Nemaco will get the other remaining parts (foam seals, handles, latches, etc.) assembled and completed for a quality NEMA 12 enclosure. By the way, Nemaco can offer customers a spectrum of powder coat & paint colors including the super Tigerbox™ orange. And after the NEMA 12 enclosure is completed and packaged properly, then Nemaco will have the enclosure shipped per the customer's preferred freight company. Nemaco has prepared the next sections as samples of Nema 12 enclosures used in industry and therefore, a customer should have a better understanding of the common enclosure applications and the associated NEMA ratings and definitions. Also, whenever possible, Nemaco will provide additional (Nemaco type enclosure & Tigerbox enclosure) photos with external and internal images of the other Nema 12 enclosure. You can call Nemaco for additional information if needed so you can find the correct enclosure for your industrial, commercial or military application. Enjoy the material that Nemaco has prepared for you, and if you have any questions, please call Nemaco by telephone or complete our contact form. Definition: Intended for indoor use primarily to provide a degree of protection against dripping pipes and dust. All Nemaco Technology's industrial 19" eia rackmount server enclosure and cabinet products are available with the following options: adjustable rack rails, clear lexan windows, temperature controlled AC cooling, double doors, grounding studs, padlock provisions, sub-panels (powder coated carbon steel & aluminum), single shelf, adjustable shelves, custom cut-outs and many custom colors (light computer gray, industrial gray, royal blue, sunny orange, super black magic). Indoor NEMA 12 Enclosure Lab Application: A typical NEMA 12 enclosure would be a metal box used for electrical controls in a lab or any indoor environment that is dry but might have dripping pipes but no rain. Usually, this type of NEMA 12 enclosure has medium manufacturing cost due to the materials and power coating. Most NEMA 12 enclosures have a foam gasket or seal on the door or any covers to prevent dust from gettting inside. Note that NEMA 12 enclosures should have a inner drip shield for most applications. Indoor NEMA 12 Enclosure Computer Enclosure in Factory Application: Most modern factories have computer controls and electric systems for automation. The NEMA 12 enclosure keeps the dust out of the electrics and the PLC'S (programmable logic controllers) for the factory automation systems. Also, Nemaco can provide air conditioning units to keep the electronics cool inside the NEMA 12 enclosure. By the way, sometimes vortex coolers can be installed on this dust proof NEMA 12 enclosures. Also, note that factories have alot of dust and many pipes, therefore a NEMA 4 or NEMA 12 enclosure is a good solution to keeping a factory running and profitable. Call or send Nemaco if you have any questions about your particular NEMA 12 enclosure, cabinet or box application. Definition: Intended for indoor use primarily to provide a degree of protection against (hand) contact with enclosed equipment. 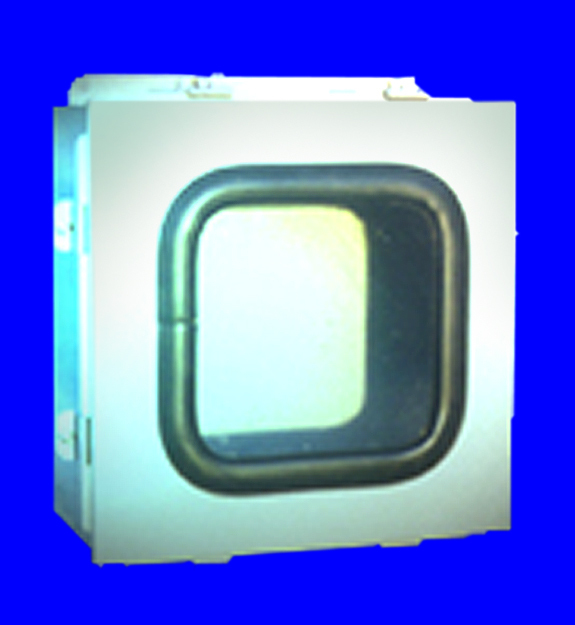 Applications: Nemaco can offer a NEMA 1 enclosure for your application. NEMA 1 industrial enclosures are typically used for protecting controls and terminations from objects and personnel. This style of enclosure, while offering a latching door, does not have a gasketed sealing surface. NEMA 1 enclosures are used in applications where sealing out dust, oil, and water is not required. Motor start/stop stations are often housed in NEMA 1 enclosures. Usually, a low cost enclosure but suitable for clean and dry environments. Custom Tigerbox™ enclosures are available for electronics applications. Definition: Intended for indoor use primarily to provide a degree of protection against limited amounts of falling dirt and water. Applications: NEMA 2 industrial enclosures are typically used for protecting controls and terminations from objects and personnel. This style of enclosure, while offering a latching door, does not have a gasketed sealing surface. NEMA 2 enclosures are used in applications where sealing out dust, oil, and water is not required. Motor start/stop stations are sometimes housed in NEMA 2 enclosures. This is a low cost enclosure also. Custom Tigerbox™ enclosure are available for electronics applications. Definition: Intended for outdoor use primarily to provide a degree of protection against windblown dust, rain, and sleet; undamaged by ice which forms on the enclosure. Applications: NEMA 3 electrical enclosures are typically used in outdoor applications for wiring and junction boxes. Nemaco of this style of enclosure provides protection against windblown dust, falling rain, sleet, snow, and external ice formation. Indoors the enclosure designed to protect against dripping water. Note that this style of enclosure has a gasket sealing surface. Nemaco installs stick gaskets and continuous gasket if required. Some NEMA 3R enclosure models have hasps for secure padlocking. Here is custom NEMA 3R enclosure manufactured by Nemaco Technology. Note that the photo of the yellow powder coated enclosure is unique since it has stainless steel rotary turn latch instead of a common and ordinary pull latch. This was a custom NEMA 3R enclosure designed for a customer that wanted easy access to the enclosure and a secure latch for sealing the door seal. Also, in the next photo of this yellow NEMA 3R enclosure, the inside sub-panel is aluminum instead the standard powder coated carbon steel. The aluminum sub-panel provides better heat transfer than a powder coated carbon steel plate that other companies provide. The Tigerbox™ NEMA 3 Enclosures are available with durable gasket seals for both indoor and outdoor applications. Call Nemaco for any NEMA NEMA 3 enclosures in powder (coated carbon steel, aluminum) and perhaps 304 or 316 stainless steel for speciality applications. Definition: Intended for outdoor use primarily to provide a degree of protection against falling rain and sleet; undamaged by ice which forms on the enclosure. Applications: NEMA 3R electrical enclosures are typically used in outdoor applications for wiring and junction boxes. This style of enclosure provides protection against falling rain, sleet, snow, and external ice formation. Indoors they protect against dripping water. Note that this style of enclosure does not require a gasket sealing surface. Some models have hasps for padlocking. The Tigerbox™ NEMA 3 Enclosures are available with optional gasket seals for both indoor and outdoor applications. Definition:Intended for indoor use primarily to provide a degree of protection against windblown dust and rain, splashing water, and hose directed water; undamage by ice which forms on the enclosure. Applications: NEMA 4 industrial enclosures are used in many applications for occasional washdown occurs or where machine tool cutter coolant is used and sprayed. Also, the Nema 4 enclosure serve well in applications where there is possibly dripping water in a building. NEMA 4 enclosures must have quality seal gasket to prevent water ingress and the door is typically clamped for maximum sealing. Nemaco installs stick gaskets and continuous seals depending the size of the enclosure. Tigerbox™ Nema 4 are commonly have continuous hinges, mounting feet and sometimes padlock hasps. Tough Tigerbox™ NEMA 4 enclosures are available in sizes from small wall mounts to two-door floor mount enclosure models. Nemaco has an NEMA 4 enclosure example shown in the photo. Definition:Intended for indoor or outdoor use primarily to provide a degree of protection against corrosion, windblown dust and rain, splashing water, and hose directed water; undamaged by ice which forms on the enclosure. Applications: NEMA 4X enclosures are typically made of stainless steel or plastic. These NEMA enclosures are used in harsher environments than standard NEMA 4 units. Applications where corrosive materials (for example saltwater) and caustic cleaners are used necessitate the use of a NEMA 4X enclosure. A few examples are applications for sanitary poultry processing facilities (where total washdown with disinfectants occur repeatedly), petro-chemical refineries and offshore drilling platforms for oil and natural gas. NEMA 4X is used when protection from the worst environments is required. NEMA 4X industrial enclosures are available in sizes from small wall mounts to two-door floor mount models. 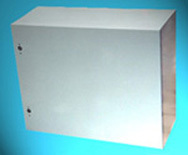 Nemaco Technology manufactures the enclosures from 304 & 316 Stainless steel. Also, the Tigerbox™ NEMA 4X enclosures are available in 304 & 316 stainless steel. Tough Tigerbox™ Nema 4X enclosures are available with continuous hinges, mounting feet and sometimes padlock hasps. Tigerbox™ NEMA 4X enclosures are offered in sizes from small wall mounts to two-door floor mount enclosure models. Also, stainless steel passivation for additional corrosion protection is available on request for all the stainless steel products. Nemaco has a NEMA 4X enclosure shown in the photo. Definition:Intended for indoor or outdoors which occasional temporary submersion is encountered. Applications: NEMA 6 enclosures are typically made of carbon steel, stainless steel or plastic. These NEMA 6 enclosures are used for many application to protect equipment from temporary submersion in water but not any salt water, acidic fluids, oils or flammable. A few examples are applications for any heavy washdown for cleaning or temporary submersion from rainwater but not prolonged. The Tough Tigerbox™ NEMA 6 enclosures are available in carbon steel, 304 & 316 stainless steel and available with continuous hinges, mounting feet and sometimes special fittings for applications. Tigerbox™ NEMA 6 enclosures are offered in sizes from small wall mounts to single-door medium size floor mount styles. Also, stainless steel passivation for additional corrosion protection is available on request for all the stainless steel products. Definition:Intended for indoor or outdoors which occasional prolonged submersion is encountered. Corrosion protection is required. Applications: NEMA 6p enclosures are mostly made of 304/316 stainless steel for industrial applications and sometimes plastic for inexpensive electronics. Nemaco Technology offers the NEMA 6P only in stainless steel (304,316). The NEMA 6p enclosures are used applications in applications where more protection is needed and there might be water submersion. Applications where corrosive materials (for example saltwater) and caustic cleaners are used necessitate the use of a NEMA 6 enclosure. Tough Tigerbox™ Nema 6p enclosures are available with special configurations that are unique for each customer's applications. And the Tigerbox™ NEMA 6p enclosures are offered in sizes from small wall mounts to two-door floor mount enclosure models. Also, stainless steel passivation for additional corrosion protection is available on request for all the stainless steel products. Definition: Enclosures are for indoor use in locations classified as Class I, Groups A, B, C, or D.
Applications: NEMA 7 enclosures are mostly made of heavy cast iron, cast stainless steel or cast aluminum. The cover flange and the base flange are machined flat and even for a type surface fit. 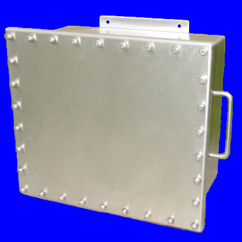 The enclosures are typically used in facortories, chemical refineries or offshore drilling platforms. Definition: Enclosures are intended for indoor use in locations classified as Class II, Groups E, F, or G, and shall be capable of preventing the entrance of dust. Enclosed heat generating devices shall not cause external surfaces to reach temperatures capable of igniting or discoloring dust on the enclosure or igniting dust-air mixtures in the surrounding atmosphere. Enclosures shall meet dust penetration and temperature design tests, and aging of gaskets (if used). Applications: NEMA 9 enclosures are mostly made of heavy cast iron, cast stainless steel or cast aluminum. The cover flange and the base flange are machined flat and even for a type surface fit. The enclosures are typically used in facortories, chemical refineries, offshore drilling platforms or dusty environment. Definition: Enclosures constructed (without knockouts) for indoor use to provide a degree of protection to personnel against incidental contact with the enclosed equipment; to provide a degree of protection against falling dirt; against circulating dust, lint, fibers, and against dripping and light splashing of liquids. Applications: NEMA 12 enclosures are designed to prevent the ingress of dust, water, and oil. NEMA 12 enclosures are most often used for indoor applications of automation control and electronic drives systems. Some examples are packaging, material handling, non-corrosive process control, and manufacturing applications. Gasketed doors seal the enclosure's contents from airborne contaminants and non-pressurized water and oil. Nemaco offers the NEMA enclosures in sizes from small wall mounts to two-door floor mount models. Nemaco has a NEMA 12 enclosure example shown in the photo. Nemaco's “4/12” enclosures combine the attributes of NEMA 4 and NEMA 12 ratings in one attractive, clean line enclosure. This enclosure features reversible doors for left or right opening, concealed hinges or removable hinges available and mounting feet are available for conventional wall mounting. Sometimes rear mounting holes with seals are available for a more attractive installation. Nemaco's enclosures are available from small sizes to large buildings. Call Nemaco for NEMA 12 enclosures and other custom stainless steel projects.